Bitwise operators in C programming. Bitwise AND (&) operator compare two bits and return 1 if both bits are set (1), otherwise return 0. Bitwise OR (|) operator compare two bits and return 1 if any of them or both bits are set (1), otherwise return 0. Bitwise XOR (^) operator compare two bits and return 1 if either of the bits are set (1), otherwise return 0. Bitwise complement (~) operator takes single operand and invert all the bits of the operand. Bitwise right shift (>>) operator insert 0 bit at most significant bit and shift subsequent bits to right. Bitwise Left shift (<<) operator insert 0 bit at least significant bit and shift subsequent bits to left. Let us get started and learn some cool bitwise operator hacks and tricks. Want to divide a number by 2 quicky. Here you go, use bitwise right shift operator to divide an integer by 2. Each right shift operation reduces the number (operand) to its half. Similar to division, you can use bitwise left shift operator to quickly multiply a number by the power of 2. Each left shift makes doubles the number (operand). To check even or odd number we generally use modulo division operator. You can use bitwise AND & operator to check whether a number is even or odd. You can also use this trick to check if a number is divisible by two or not. Read more how to use bitwise AND operator to check even or odd. 21 is an ODD number. We often use variable to store boolean flag values e.g. isEven, isMarried, isPrime etc. Instead of wasting 4 byte to store single flag. You can use bit masking to store multiple flag values in single variable. A 4 byte unsigned integer can store 32 flags. We use bitwise OR | operator to set flag. To unset or check flag status we use bitwise AND & operator. At a high level it is known as bit masking, but you can think it as set, unset and check a bit status. In below example I will set, check and reset three flag values. Flag for marital status at 0th bit, voting status at 1st bit, VISA status at 2nd bit. // Make all bits off. // Unset or set all flags to false. You are eligible for voting. You are eligible to get VISA. One's complement of a binary number is defined as value obtained after inverting all bits of the number. We use bitwise complement operator ~ operator, to find 1s complement of a number. You can get two's complement of a binary number by adding 1 to its one's complement. This is my favourite hack. You can use bitwise OR and AND operator to convert a character to lowercase and uppercase respectively. How to convert string to lowercase. How to convert string to uppercase. To convert a character ch to lowercase use ch = ch | ' '. Whether ch is uppercase or lowercase. Result of this is always a lowercase character. To convert a character ch to uppercase use ch = ch & '_'. It always return uppercase character, doesn't matter whether ch is uppercase or lowercase. You can use bitwise XOR operator for these type of assignment. Another hack frequently asked in interviews. We all know to find maximum or minimum using if else. Let's do it bitwise way. Frequently asked in interviews, how to swap two numbers without using third variable. You can use bitwise XOR ^ operator to swap two variables without using third variable. Bitwise XOR operator is one of the magical operators in C. It has a special property, suppose a and b two integers and c = a ^ b. Then, the result of a ^ b i.e. c, when XORed with a return b and vice versa. We can use this feature of XOR operator for basic encryption/decryption. Enter text to encrypt: I love C programming. Original text: I love C programming. 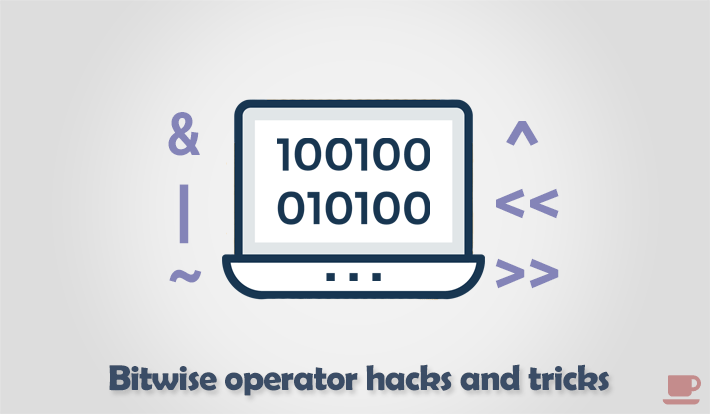 Tell us your favorite bitwise operator hacks and tricks in the comments section. Or you got some more hacks please share with us.